Get Your Mouth Off My Hot Dog! I’m a Chicagoan – born in suburbia and currently live in the city. I get the North vs. South Side. I understand our mutual hate and aversion of the Packers, Cardinals and Red Wings. How we have that feeling of being the Second City compared to NYC or at times even LA. Our city is world class even if we couldn’t buy an Olympics – the Chicago way! Yet, I loathe having a transplant tell me one of the great Chicago columnists is using histrionics to vilify ketchup on a hot dog. No way he would have written this if Royko were still with us. Big word – what is histrionics? Histrionic – adj. /?histre'änik/ 1.Overly theatrical or melodramatic in character or style. 2. Of or concerning actors or acting. 3. Denoting a personality disorder marked by shallow, volatile emotions, and attention-seeking behavior. Um, don’t you write for those "Foodie Fascists?" I’m not sure I agree with Mr. Ruby’s “McCarthy-esq” comments. He does critique menus and plates of food and judges on a regular basis when he writes a review. Or maybe I’ve hit my head? Kevin why not be a man and stand up and say - I love Ketchup on my hot dogs. I’m not from Chicago but I was raised differently. Why poke and prod and call us fascists, histrionic dummies who are trying to boost our collective ego by renouncing ketchup because we’re the Second City? What’s next? Will you now tell those in the South that cole slaw is a side and not a sandwich topping? Perhaps, Skyline Chili should be enjoyed plain and not over pasta? I know – brats should never be boiled in beer! I’ve figured it out…Kevin has nothing else to write about. He’s been known to write long diatribes about culinary personalities of Chicago. The misunderstood of the industry are best served by Kevin’s mea culpa-esq stories. Please, love me again! You can’t romance yourself out of this corner. I predict the next long soliloquy will be around The Black Sheep debacle. James Toland really IS a genius and Michael Simon never was a partner despite the tattoo and name on the signage. While I don’t always eat a hot dog, when I do I prefer Gene and Jude’s – with mustard and onions. Only douchebags put ketchup on hotdogs. I think they may also sleep in adult diapers, but I'm not sure about that. The douchebag thing though I'm sure of. Only a douchebag who's insecure cares what other people do to their food. Don't put ketchup on MY hot dog, but do what you like to yours. What are you gonna tell me next ? That I can't put sugar in my coffee? Is there anything else you like to clarify for me, Gwill? Maybe you can manage my entire life for me. 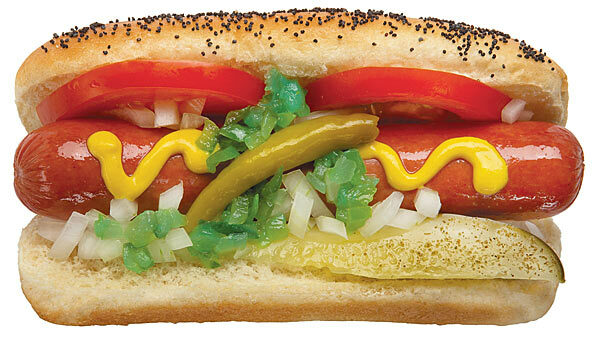 No ketchup on Chicago Dogs! If you want to try it, fine. Free country. But we'll know you're not from around here. I saw that photo and almost hurled. Born in the suburbs? You are not even a real Chicagoan. Shut up already. Pang is not even from the suburbs? He is a transplant. No wonder. Born and raised on the SOUT Side, left Chi Town in 1966 due to issues in Southeast Asia. NO ketchup on Chicago Dogs!!!!!! I think Portillo's will actually chuck you out the door if you ask them to put ketchup on the Chicago Dog! Of course you can put whatever you want on your hot dogs or anything else. Nobody's getting arrested for it. It just means they are terrible, evil people who should be flogged in public.